A new Quinnipiac University poll released on Thursday found that the majority of U.S. voters — 58% — don't find kneeling by NFL players during the national anthem unpatriotic. 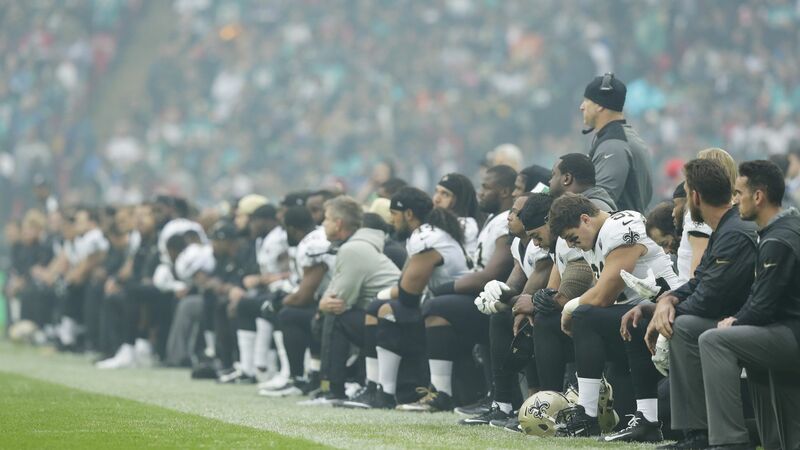 Why it matters: President Trump's culture war against the NFL hinges on the argument that players are ignoring the wishes of their fans and disrespecting the flag and U.S. military by kneeling in protest during the national anthem. The majority of Republicans (70%) find the protest unpatriotic, opposed to 23% who don't. When it comes to athletes' right to protest, 82% of Democrats say they do have the right on the playing field or court — while 81% of Republicans say they do not. 51% of voters support the NFL's new policy that requires players on the field to stand for the anthem. One more thing: More broadly, Americans disapprove of how Trump is handling race relations — with 61% against and 33% in support.